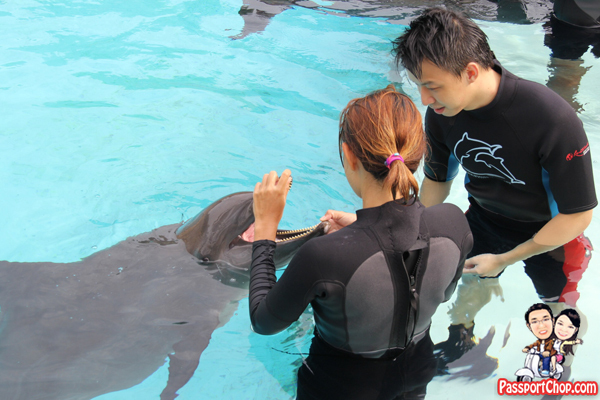 The Resorts World Sentosa Dolphin Trek Experience offers guests the opportunity to interact with Indo-Pacific Bottlenose Dolphins underwater up close without the need to be a certified scuba diver or even know how to swim or dive. 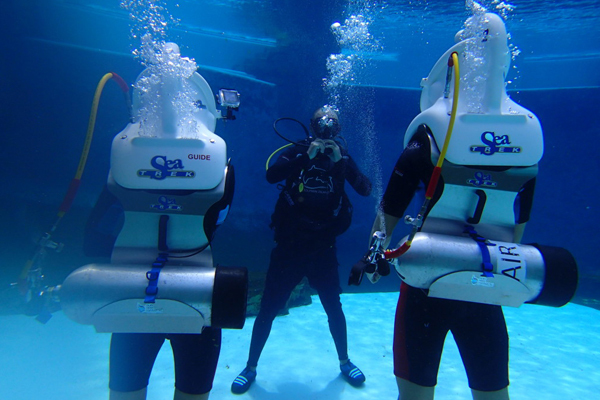 Using the SeaTREK system, you will be able to walk around on the lagoon floor and breathe freely through a SeaTREK underwater helmet four metres deep in the water without getting your hair wet! 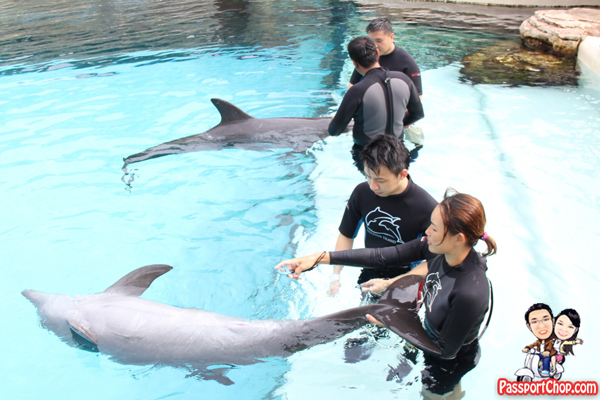 This Dolphin Trek Experience is held at the Dolphin Island within the Resorts World Sentosa Adventure Cove. PassportChop.com had the opportunity to participate in this unforgettable Dolphin Trek Experience recently; we will provide an overview of our experience with the SeaTREK equipment and the dolphin interaction programme in this blog post. 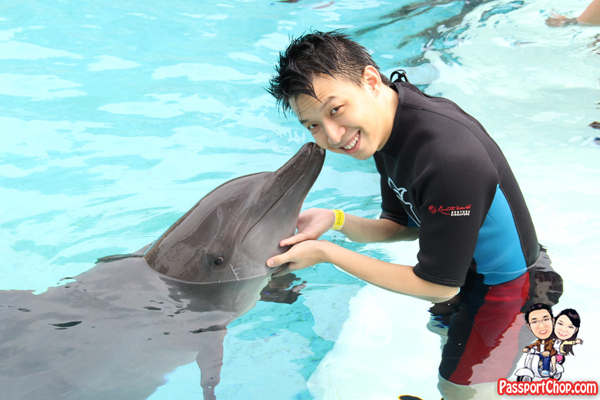 The entire Dolphin Trek Experience at Resorts World Sentosa Dolphin Island lasted about 90 minutes with about 20 minutes of dolphin interaction time. 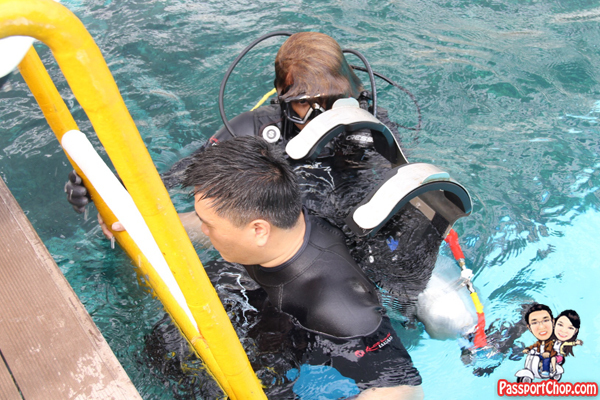 There was a 15-minute safety and training video brief on what to take note when using the SeaTREK equipment underwater and what to expect during the underwater encounter with the dolphins (e.g. different type of hand signals from the guide). 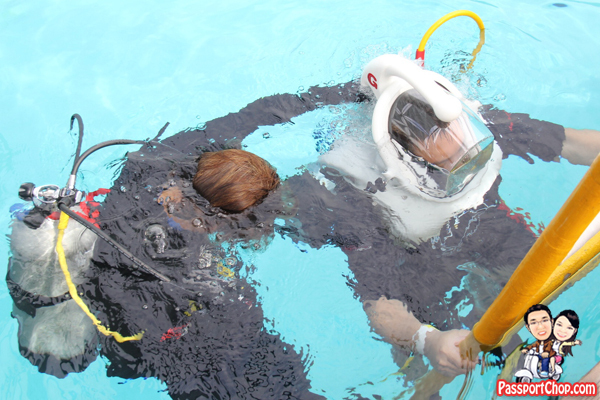 The rest of the time was spent suiting up – wetsuits and a pair of underwater boots were provided; guests will still have to wear their swimwear within the wetsuit. Guests will have to deposit all their valuables and bags in a locker (complimentary) before entering the Dolphin Island with just their clothes and footwear. No loose items are allowed during the Dolphin Trek e.g. watches, rings, earrings, necklaces, camera. There are changing rooms available in Dolphin Island; I advise that guests wear their swimwear under their clothes before entering Dolphin Island. 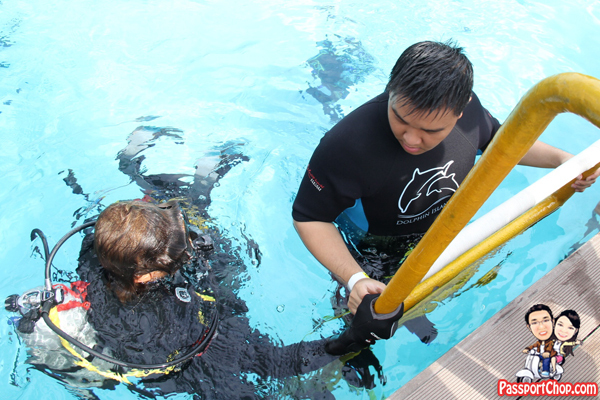 The thought of going underwater when you have no diving/swimming experience might sound daunting to some but it is actually quite a safe and ok experience when you are equipped with SeaTREK. You just have to follow the simple instructions from the Dolphin Island staff at all times and take your time to do what you have to do slowly. The next few pictures will demonstrate the process of how Dolphin Island staff will prepare you for the Dolphin Trek Experience. The SeaTREK Self-Contained Backpack System incorporates an integrated air supply (air cylinder) secured to a stainless steel backpack. A continuous flow of air is supplied to each helmet, without air lines to the surface. When you descend the vertical entry ladder, the Dolphin Island staff first fits the backpack onto your shoulder, with the air cylinder resting in the cradle. The SeaTREK helmet is then set onto your shoulder, and the air line is connected from the air cylinder to the helmet. Do note that the SeaTREK helmet weighs approximately 70 lbs (32 kg) above water, while underwater, the weight of the helmet is about 15 lbs (6 kg). You can still wear prescription glasses and contact lenses during the Dolphin Trek – bespectacled guests will be given a spectacle band to secure the glasses. You remain completely dry from the shoulders up – a very simplistic explanation of how the SeaTREK equipment works is as shown in the diagram below (primary school Science!) except that three times more oxygen that we require is pumped into the helmet. So just breathe normally – you won’t be short of air. You should avoid huge movements while underwater – just like in the example below, if you tilt the cup, water will flow in. 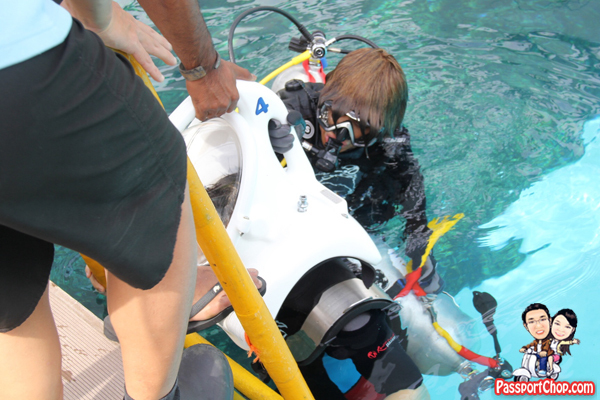 As this is a seawater lagoon, it might get uncomfortable if water flows into the helmet! … and down we go into the lagoon! The water can be quite cold – thankfully the wetsuit is insulated so it kept us warm during the Dolphin Trek. 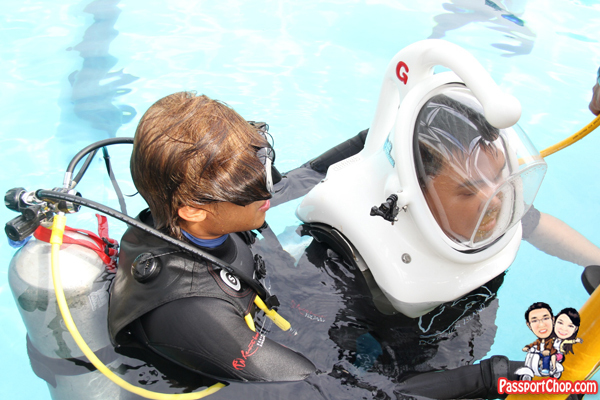 You will hear a loud “POP” when you enter the water and a strong gust of air will blow into your helmet – this is normal. Your ears will start to get blocked due to the change in pressure so just swallow or yawn to equalize the pressure and you are good to go interact with the dolphins. Once you have reached the lagoon floor, you might find simple acts like turning around involved quite a lot of effort and elaborate feats of shuffling, while moving forward took the form of stiff, baby steps like a robot. There are at least 3 divers with you at all times – the safety diver behind you, the diver-photographer who will stalk your every move with his/her underwater camera and the diver-instructor who will give instructions to both you and the dolphins to facilitate the interaction. You will also have become part of the Resorts World Sentosa Marine Life Park S.E.A Aquarium temporary exhibit as the lagoon is part of the Aquarium’s viewing gallery – you will be an instant celebrity as Aquarium guests gather around the window to take pictures of you and the dolphins! As part of the Dolphin Trek experience, one of the two dolphins swimming in the lagoon was cued by Janet (our diver-instructor) to swim gently past us so that we could touch it. The dolphin’s smooth skin felt like rubber (just like what you will feel when you touch a tyre without its tyre tread patterns). We were kept at arm’s length from the dolphin lest it hits our helmet with its tail. With every action completed by the dolphins, they would swim back to the surface for a treat before swimming back down on Janet’s cue for the next action. The dolphins were gentle and on Janet’s cue, they would swim gently so that you would be near enough to “kiss” and “hug” the dolphins (as shown in the pictures below). Guests on the Dolphin Trek will also have the opportunity to witness the dolphins’ swimming prowess when they dash around the lagoon like torpedos or spin gracefully within the lagoon. After about 10-15 minutes of underwater interactions with the dolphins, we were brought to the surface and our SeaTREK equipment were removed. We were then led to a shallow part of the lagoon where we would wade into the lagoon waist-deep to meet the 2 dolphins up close. 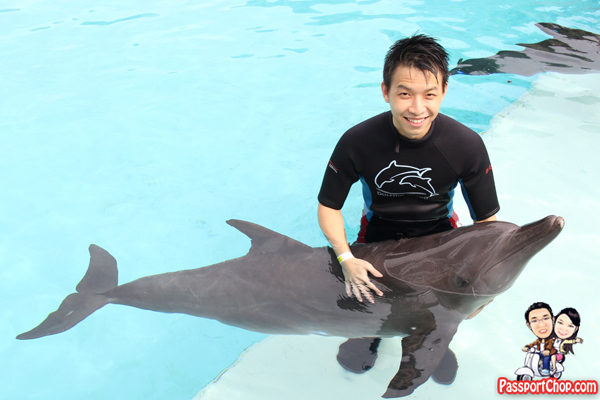 This is akin to the Dolphin Discovery interaction programme (Adult $198, Child/Senior $188) here at Dolphin Island. 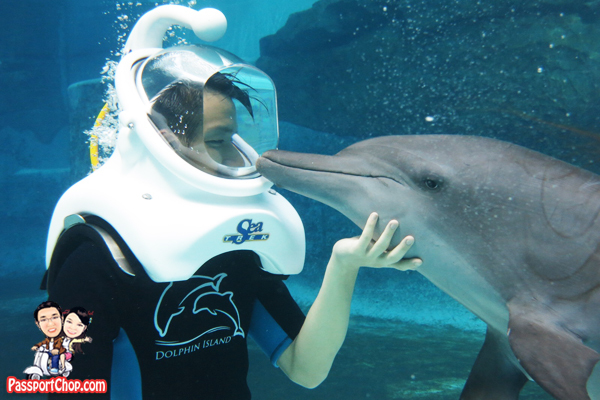 For this Dolphin Trek surface interaction experience, you will get the opportunity to be “kissed” by a dolphin and “hug” one. The dolphins will swim towards you for the kissing/hugging position and you then pose accordingly – our hands barely touched the dolphin and it was over in seconds. 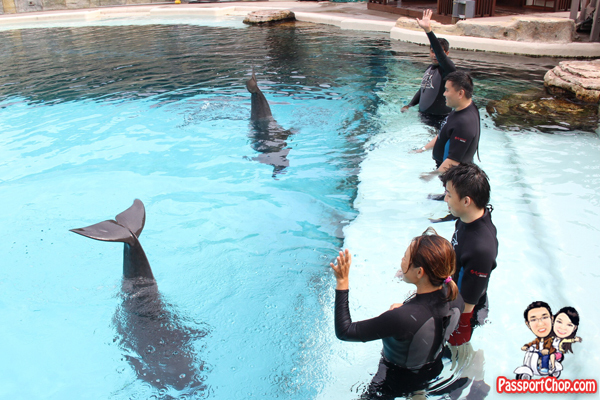 The Resorts World Sentosa Dolphin Trek aims to provide visitors with a deeper understanding of marine life, and to discover more about dolphins through “engagement learning”. The Dolphin Island marine mammal trainers and hosts will share knowledge about dolphins, their habitats, diets, anatomies and migration patterns during the dolphin interaction programmes e.g. as shown below, we got to learn about how you can tell the age of a dolphin from its set of teeth. We concluded our Dolphin Trek with a goodbye wave from the 2 dolphins! 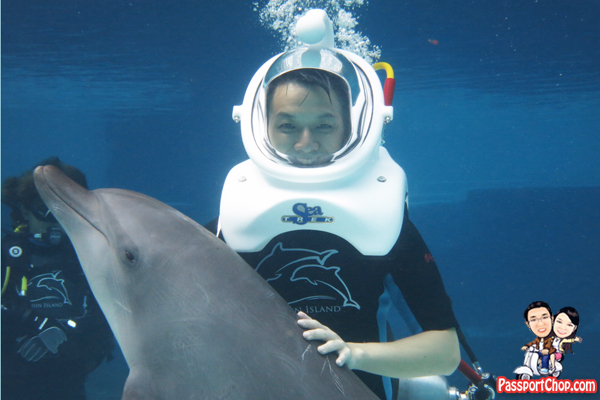 Thanks to our diver-instructor Janet (pictured below) and our orientation host Yong Wei, we had a good time exploring Dolphin Island and learning more about the dolphins through the Dolphin Trek experience. ▸ Senior (60 years & above). ▸ SCUBA-certification is not required. ▸ Suitable for non swimmers. Guests must be at least 15 years old to participate. ▸ A parent or guardian (21 years old and above) must be present to authorise participation for all programme participants who are below 21 years old. ▸ Guests must not be due to fly within the next 24 hours. 1 day admission to Adventure Cove Waterpark. Admission is valid only on the day of your scheduled dolphin interaction. One set meal at The Bay Restaurant. 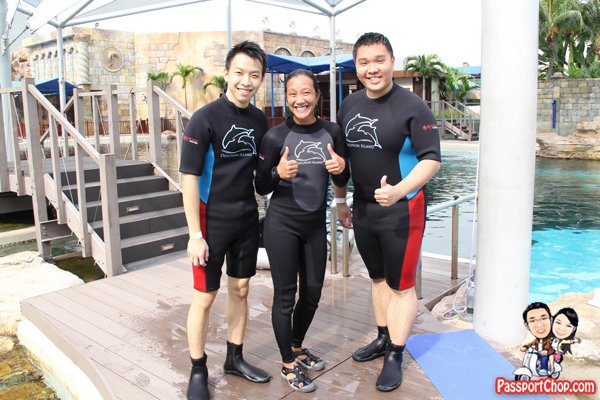 Complimentary use of Dolphin Island lockers, towel, wetsuit, and flotation devices during the interaction programme. 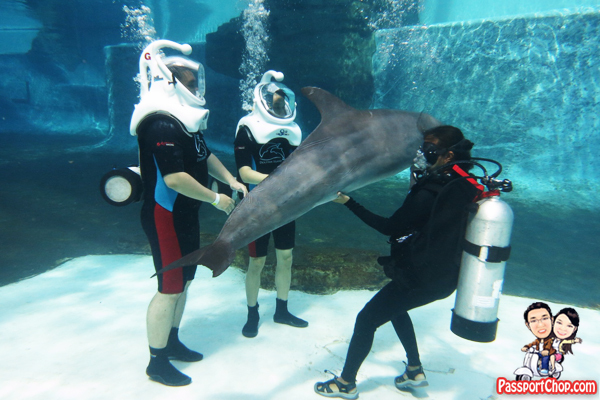 Guests who prefer to stay dry can opt for the Dolphin Observer. Exclusively for family and friends of participants of the Dolphin Discovery programme, this is an educational tour where guests will get to learn interesting facts about the Indo-Pacific Bottlenose Dolphins. Guests will get to watch the dolphins and the participants from the comfort of the pavilion, where drinks are also served. Prices range from $58 for children/seniors to $68 for adults. Unlike other dolphin themed parks, there are no dolphin performances held at Dolphin Island so the Dolphin Observer is perhaps the best way to observe the dolphins and learn about them without getting wet. If you want to skip lines at Dolphin Adventure/Dolphin Discovery and get discounted tickets up to 50% off, check out Klook! They offer exclusive insider deals from skip-the-line passes and ticket collection is hassle-free. You will receive your e-ticket(s) instantly after you book with Klook. All you have to do is to show the e-ticket(s) at the entrance and you will be admitted straight away. There are outdoor shower facilities in Dolphin Island that are provided for guests to use before and after the dolphin interaction program. However, if you need indoor shower facilities, you will need to use the ones at Adventure Cove which can be quite crowded. Expect long shower queues. 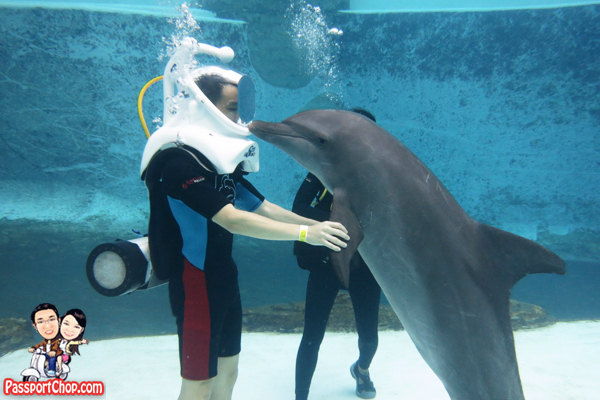 Dolphin Island’s operating hours are from 10am to 6pm daily. Do note that interaction programmes are subject to change and should be verified on Resorts World Sentosa website, www.rwsentosa.com and Resorts World Sentosa Reservation Hotline (+65 6577 8888) for the latest updates. Guests can opt for a leisurely 10 minutes stroll into Sentosa via the Sentosa Boardwalk. Admission into the island is $1 per entry by this mode of entry. After passing through the gantries, look out for signs pinpointing S.E.A. Aquarium’s location. RWS 8 is a public bus service which will bring guests directly into Resorts World for a $3 fee (Guests need not pay for the island admission if they are entering Sentosa via RWS 8). The disembarkation point would be outside the RWS Casino. There are two boarding locations for the bus (outside of Vivo City, and Merill Lynch Building). Sentosa Express is located on Level 3 of Vivo City. Guests are required to pay $4 for this mode of admission. The Sentosa Express Tickets can be bought at the Sentosa counters located right outside the Sentosa Express gantries or just tap your EZ-link card to get in. If you enter via RWS B1 car park, only car park charges apply. If you enter via Sentosa gantry, Sentosa Island admission and car park charges apply.